I have been a Moodle developer in the UK FE and HE sectors for over a decade and have built a reputation for developing innovative e-learning solutions. 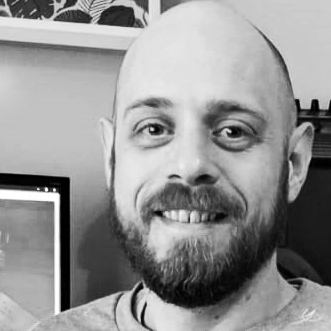 Although I specialise in Moodle VLE development and integration with FE MIS systems I have a passion for all things web related and take pride in my in-depth knowledge. Since the web was in it's infancy I have been fascinated by it, and learning every aspect of how it works has become a lifelong obsession. Being able to build interesting and engaging solutions on the web is more than just my job. From stylish Moodle themes to complete customisations with bespoke blocks and plugins, innovative course formats and informative reports. I have experience in integrating Moodle with a range of systems such as EBS, Heritage, Shibboleth, Active Directory, Kaltura, Facebook, Twitter, Office 365 and more. I deliver training packages to cover everything from the technical development and administration of Moodle to using resources and activities effectively. I create stylish websites using Wordpress, complete with custom plugins and widgets. These can be integrated with Moodle for a seamless experience. 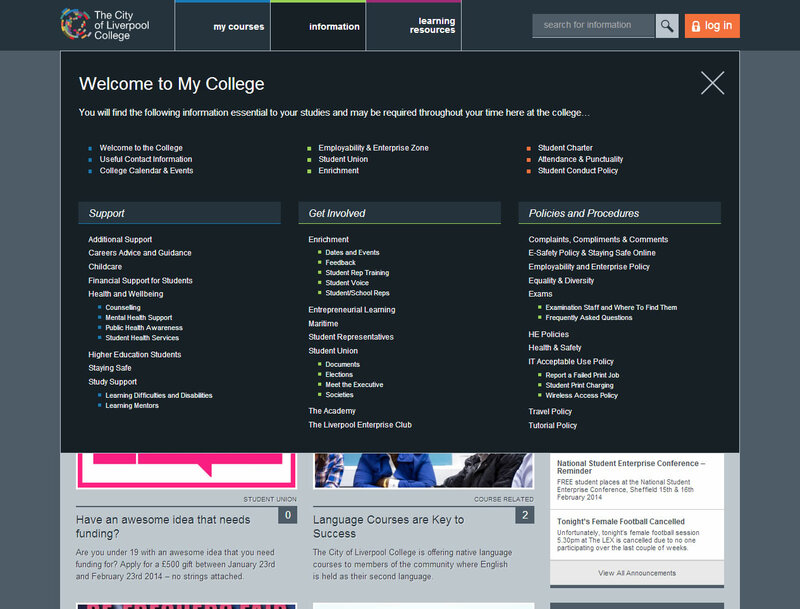 Refresh of the Student Intranet and VLE for The City of Liverpool College. 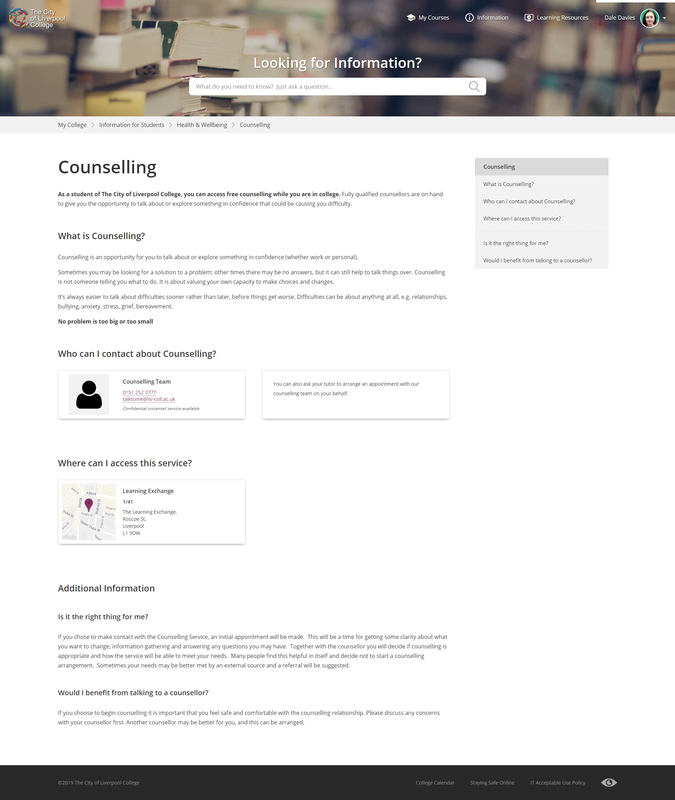 Custom Wordpress theme and knowledgebase system utilising natural language based search, a custom Moodle 3.6 theme, course format, various custom plugins and modules. 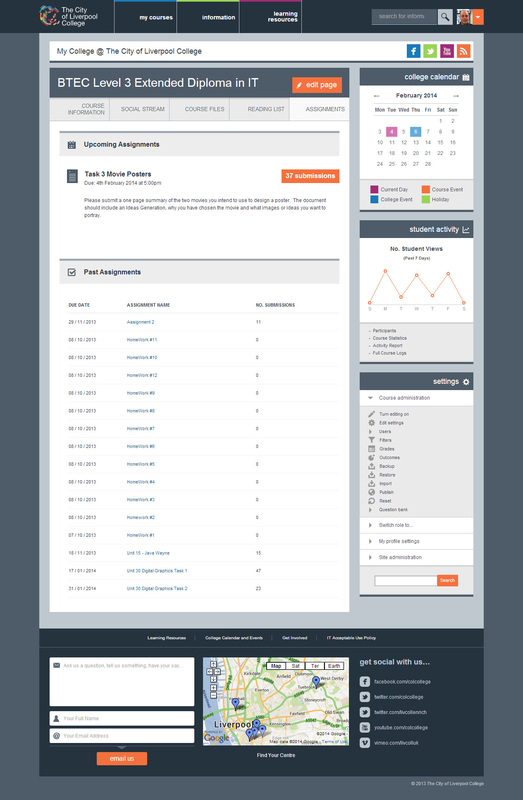 Integration with the college's MIS system, Office 365 and several other back-end systems. 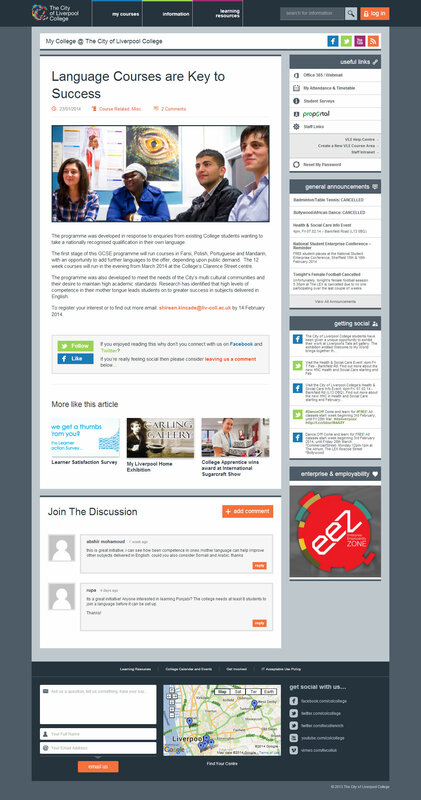 This was the second redevelopment of the City of Liverpool College's Student Intranet and VLE. Building on the college's journey from the previous VLE implementation this project allowed us to make many improvements over the standard Moodle installation. 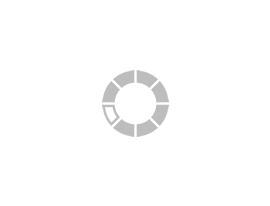 The technical implementation of this project comprises custom elements for both Wordpress and Moodle. To achieve this I developed a custom Wordpress theme and knowledgebase system utilising natural language based search, a custom Moodle 3.6 theme, custom course format, various custom plugins and activity modules, plus integration with the college's MIS system, Office 365 and several other back-end systems. I worked with staff and student focus groups to discover what had worked and where further improvements could be made. The main feedback from both groups was that staff found it difficult to organise information within their course area while students felt both course related information and general college information was hard to find. Work Experience Placements - Allows WE team to advertise placements, students can register interest and apply online. E-Resource Directory - Allows LRC team to list various 3rd part e-resources, the plugin facilitates access to these via several authentication methods. 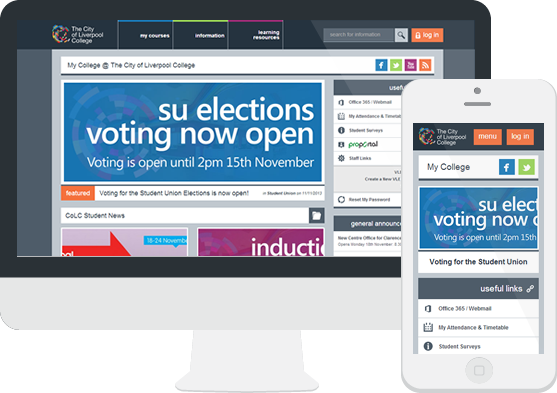 Student Union Voting - Allows SU team to create online voting areas for various Student Union positions where students can vote on candidate manifestos, supports Alternative Transferable Vote method of election. 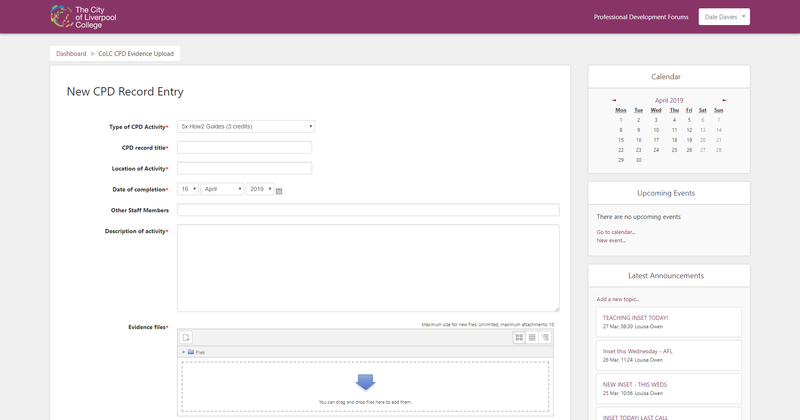 This is a custom plugin for Wordpress providing a structured knowledgebase supporting natural language based search. Each piece of information entered in the knowledgebase can be one of several types (general, person, contact, location or download). Pages listed on the website front-end are built from these smaller pieces of information, allowing each page to have a consistent layout. When searching for information the user can enter complex questions, each query is parsed by a cloud based service (DialogFlow) which determines the knowledgebase search domain and several keywords. The end goal is to initially retrieve an information "card" containing just the piece of information that was asked for. This project began with creation of a custom theme for Moodle based on the standard Boost theme, however the main Nav drawer has been recreated to provide more flexibility. 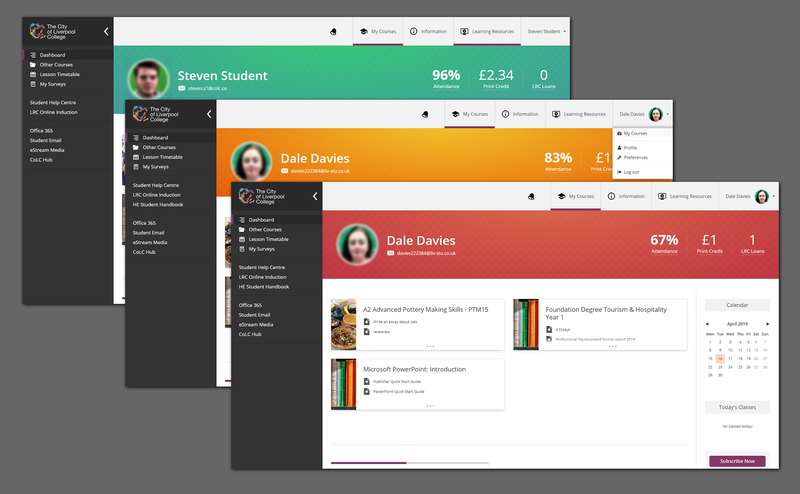 The student dashboard provides a RAG rated (red, amber, green) header based on attendance thresholds and displays information such as attendance percentage, library loans and print credit. 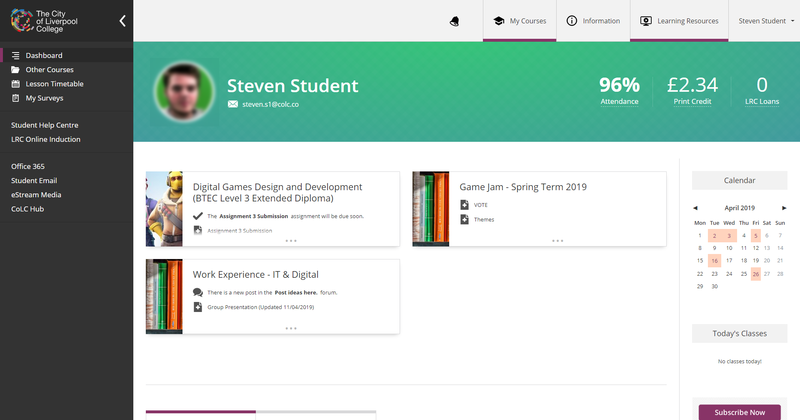 Also featured on the dashboard is a custom "My Courses" block displaying the users' courses with notifications such as recently added resources, upcoming assignments, forum replies and awarded badges. In addition to the main "Course Summary" page, courses on My College allows teachers to add individual sub-pages of content, each available under the "Course Content" section of the course navigation. On each page, sections and sub-sections can be created to hold several levels of organisation, sections can also be collapsed to create lessons which allow for a third level of page hierarchy within a course. 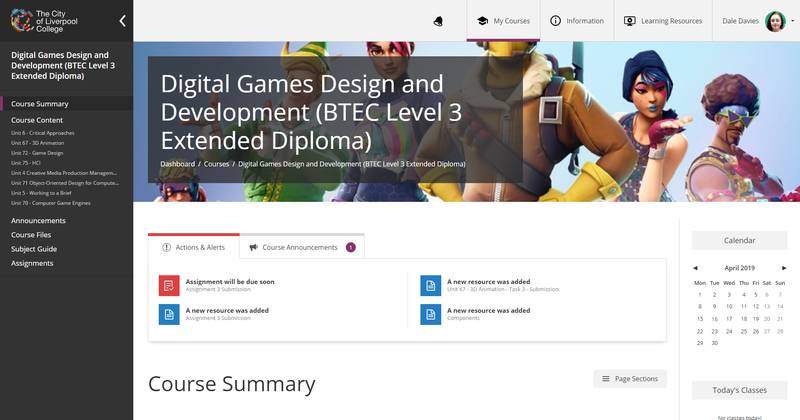 Also available for each course are a Files area that provides a searchable overview of every file uploaded into the course and an Assignments area that lists all assignments added to the course, allowing the student to filter assignments based on due date and submission status. Custom dimensions were created in Google Analytics for Moodle User ID, Moodle User Role, Inside/Outside College, Moodle Page Type, Moodle Page Component and Moodle Course ID. Information from Moodle can then be pushed to Google Analytics using these new dimensions allowing for the creation of more meaningful statistics on Moodle specific usage. A custom statistics dashboard has been integrated into the course page listing many useful metrics. Users can subscribe to push notifications from Moodle, to facilitate this a custom message output plugin was created that implements the HTML5 notifications API. Teachers can create link directories to group related links together, existing URL resources can easily be added into this, allowing teachers to quickly tidy up long lists of links. All college staff must accumulate CPD credits throughout the year and had previously been completing paper based CPD records. 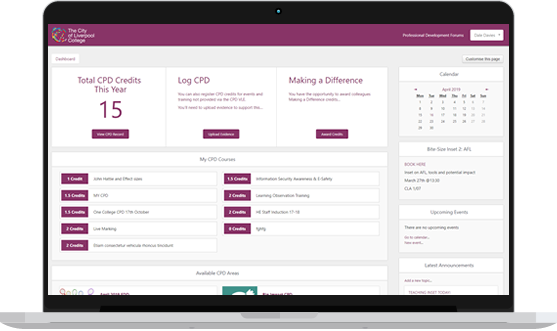 In the new My CPD VLE site, staff can now complete online courses to achieve credits, submit evidence online if they have attended external training, and even nominate other members of staff to receive "Making a Difference" credits. 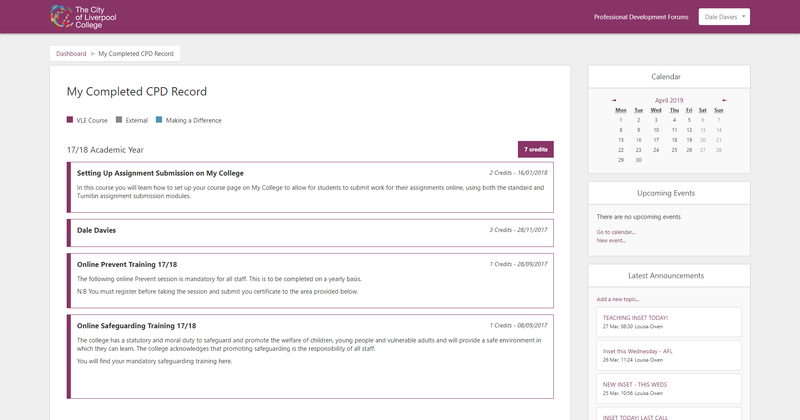 Prior to the introduction of the My CPD site, the college had maintained a staff CPD VLE for several years using a basic Moodle install. However, it was identified that improvements could be made to better support the college's CPD process. College staff must accumulate CPD credits throughout the year and had previously been completing paper based CPD records. 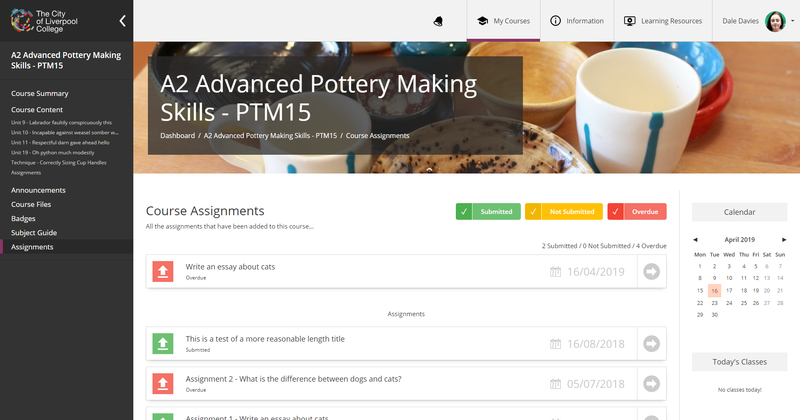 I developed a set of plugins (local plugins, course formats, reports and blocks) that facilitate this online within Moodle. 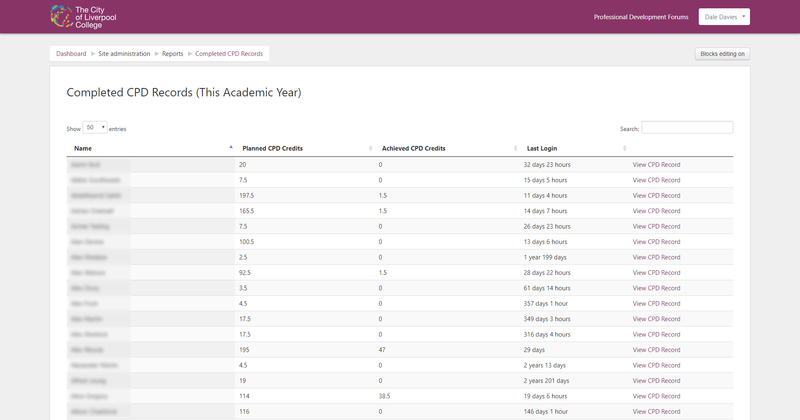 The following screenshots show the reworked VLE dashboard, a custom block is placed at the top of the dashboard indicating the number of CPD credits accumulated by the user in the current academic year and providing easy access to the users CPD record, uploading evidence, and Making a Difference facility. There are two main custom reports available in the system. 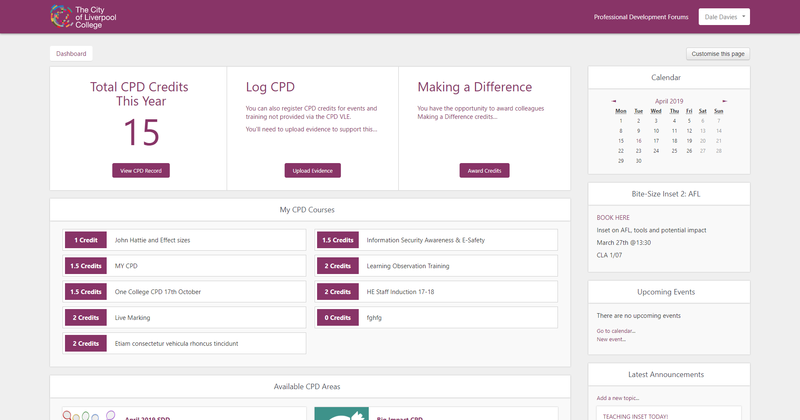 Each user has access to their individual CPD Record which can be exported to PDF. This is broken down by academic year and clearly indicated the type of CPD completed. There is also an overview of completed staff CPD records available to area managers (a custom user role assigned to cohorts of users), which limits the report to users that have been assigned to the particular manager. 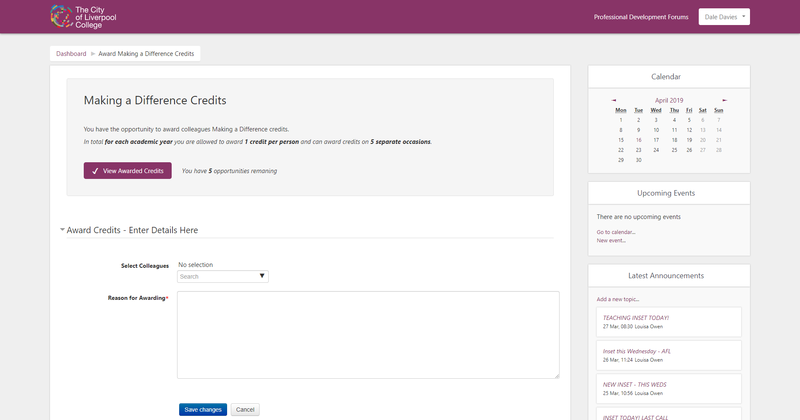 A custom course format was created to facilitate the inclusion of a CPD credit score for each course, there is also a message at the top of the page that warns users with a Manager or Teacher role that they must complete the course under a Student role in order to achieve credits. 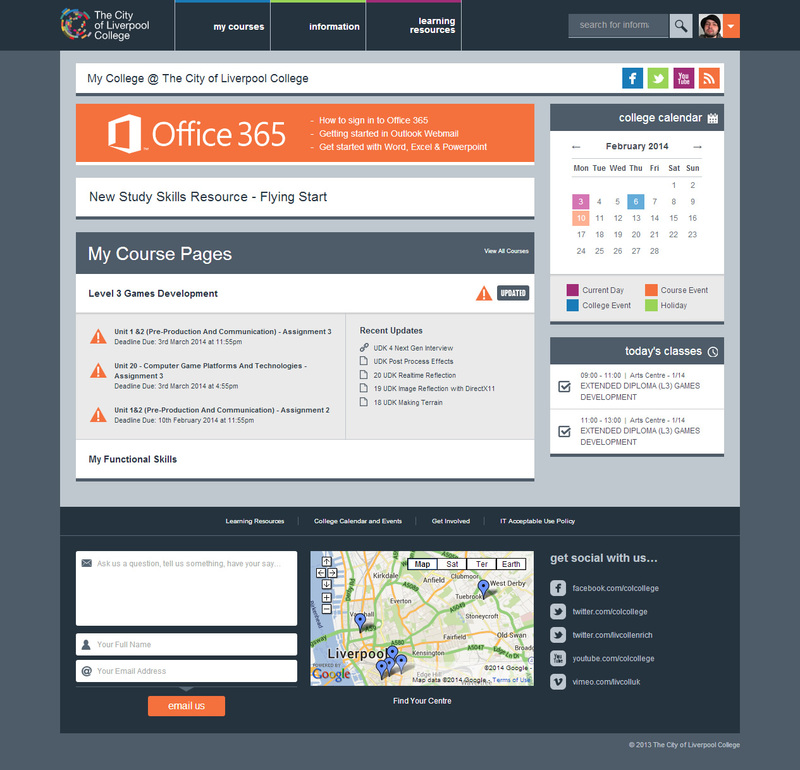 My College - Student Intranet and VLE for The City of Liverpool College. 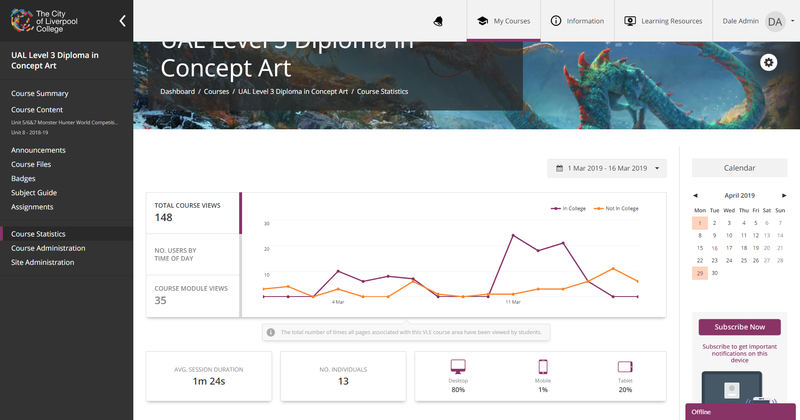 A mobile responsive Moodle 2.4 theme, custom My Courses page, innovative tabbed course formats, custom blocks, deep integration with other online college systems. 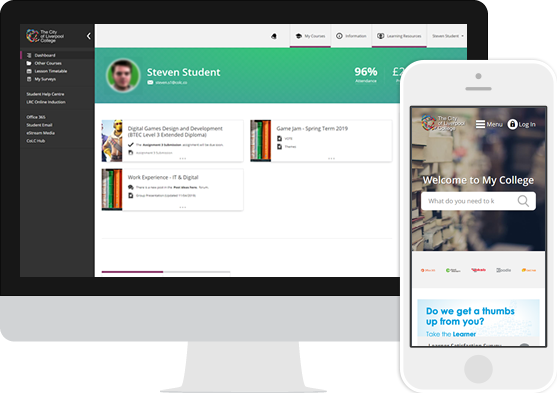 Integrated with a responsive Wordpress theme, custom widgets and Student Union voting plugin. 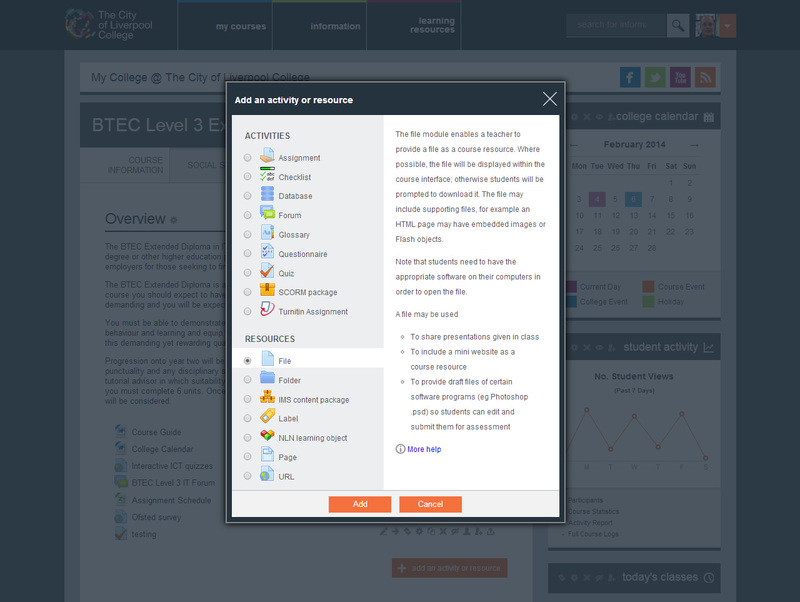 This was 12-month project to transform The City of Liverpool College's Student Intranet and VLE, producing a system that better suits the needs of students and teachers. 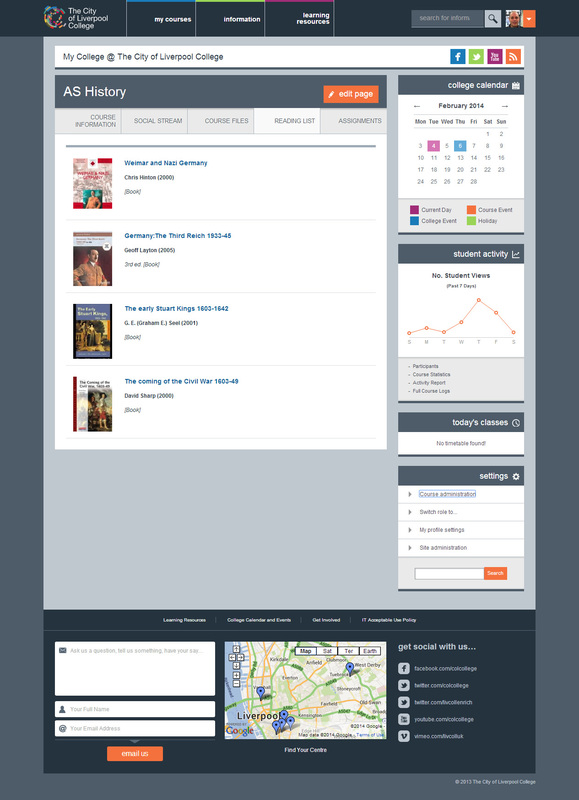 The new Moodle-based VLE is modern and engaging, with a responsive layout that is usable on all devices. The VLE has a completely redesigned course format with separate sections for course information, files, assignments and reading lists. 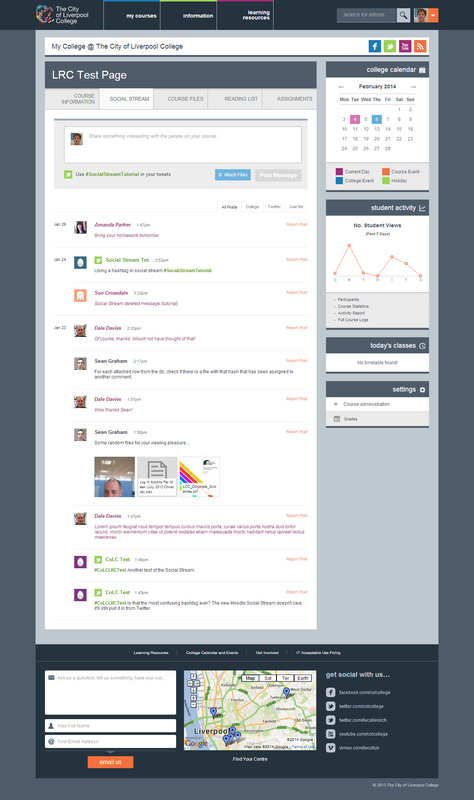 Each course also contains it's own social stream, where students and teachers can share anything. Teachers can also choose to have hashtags pulled in directly from Twitter. The project began by auditing the existing website and content, and holding staff and student consultation sessions to identify areas for improvement. 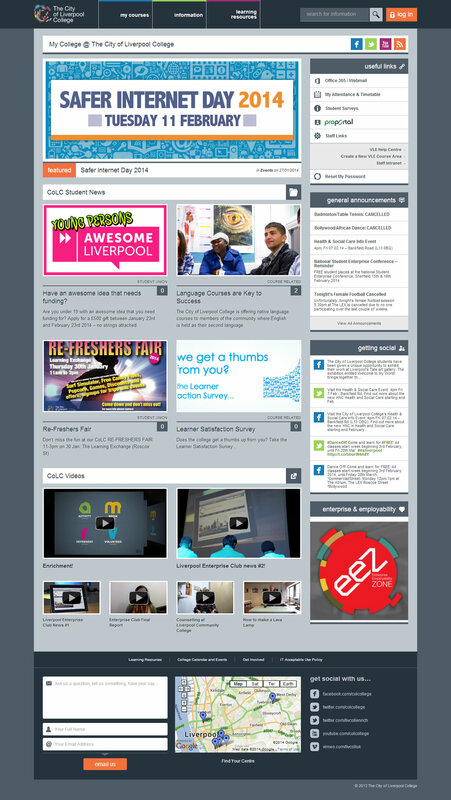 The Student Intranet area of the new My College website is based on Wordpress, I created a fully responsive theme plus several custom plugins, including a voting system for the college's Student Union. There is also an innovative drop-down menu layout, designed to present a more logical and intuitive arrangement of the vast amount of content. 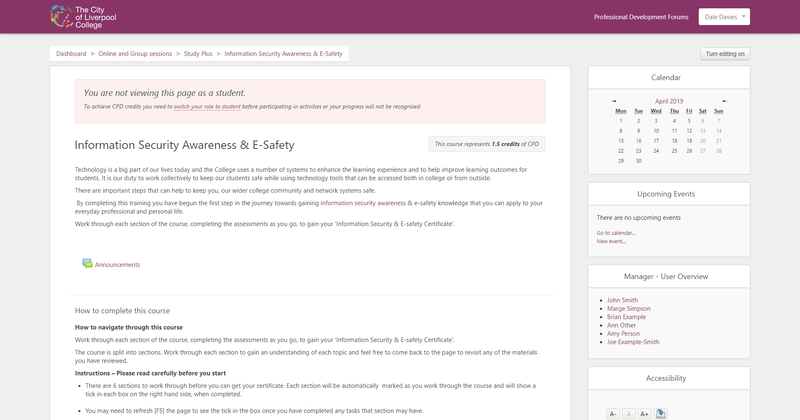 After consultation sessions with students and teachers a concept for the new VLE layout was created. 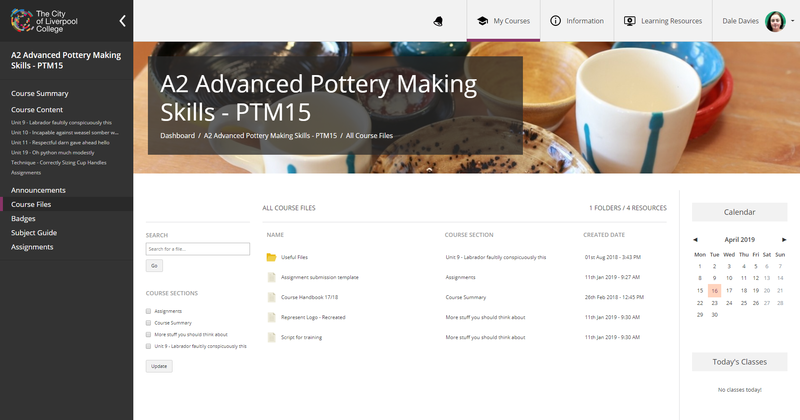 One of the main issues I was asked to address was the need to separate out course pages into sections to make vital content and functions easier to navigate. 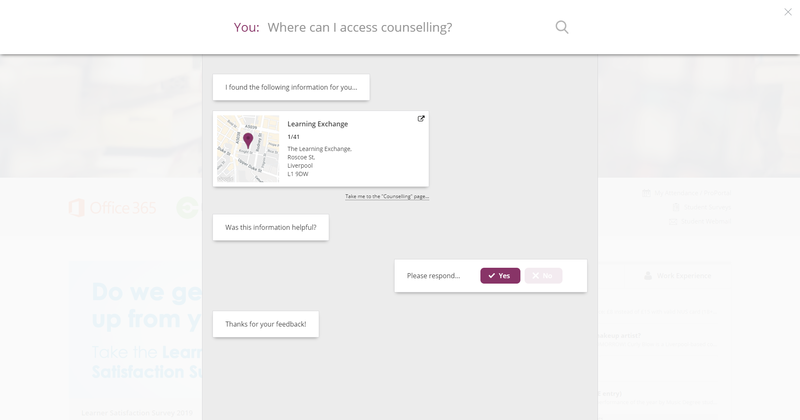 To get a feel for how the new VLE works, please view the following short videos. Part of a series of tutorial videos created using Camtasia Studio, these demonstrate some of the custom functionality added on top of the new course format. 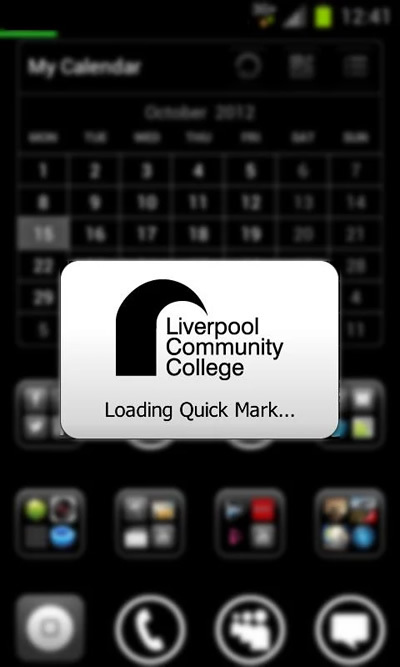 Quick Mark is an iPad/Android app that teachers at Liverpool Community College can use to mark registers in class. 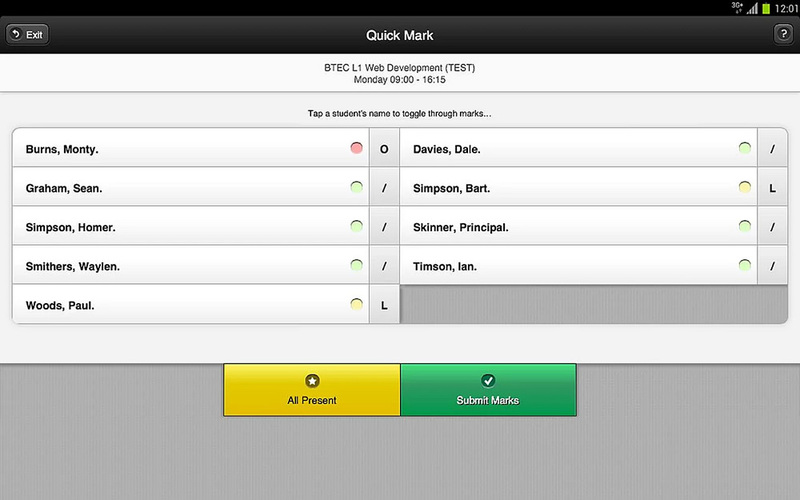 The Quick Mark web app can also be used with an interactive whiteboard to make register marking a class activity. 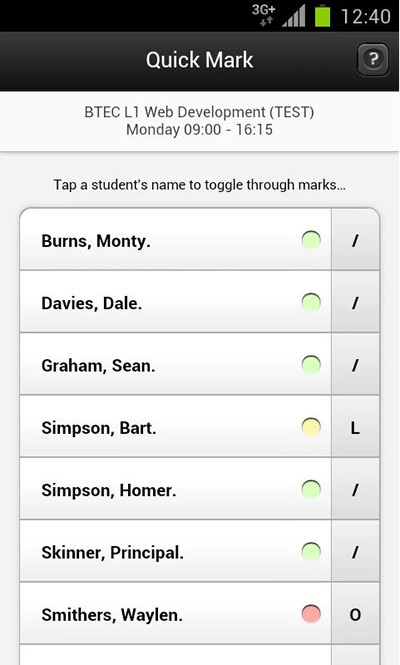 Quick Mark is a mobile solution for register marking allowing teachers to mark their current register with ease using any modern web-enabled mobile device, students' attendance details show instantly inside the college's MIS system and VLE upon submission. 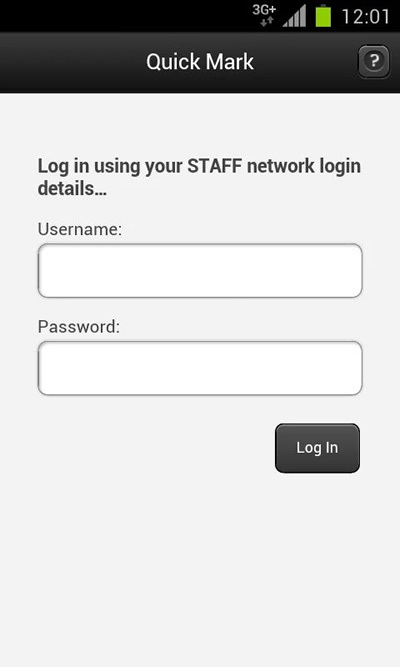 As part of a collaborative project my role was to design and develop the Quick Mark web front-end and Android app, interfacing with database procedures written within the college's MIS department. 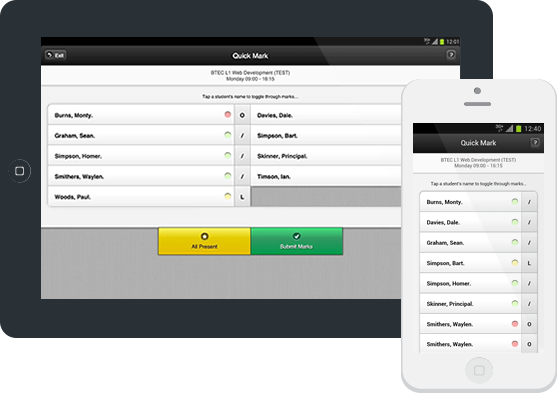 Quick Mark can be installed on iPhones, iPads and Android devices, and is also available as a web app for use with any touch-enabled device such as an Interactive Whiteboard.